Yes, I’ve done it! After a grueling 30 days of straight writing, I’ve completed the National Novel Writing Month (NaNoWriMo) challenge and finished my first draft of my novel with 50,078 words. It feels so incredible to have written my own book. I had a strict schedule. As I mentioned in the last post, I took my laptop to work and wrote during my lunch break to get a head start. Then, after dinner, while everyone in the house was watching TV, I made myself a huge mug of hot tea, lit a candle, set my iPod to play the soundtrack of the Lord of the Rings, then sat at the kitchen table and wrote for about 2-3 hours a night. Sleep? What’s that? On most days I did. I was so excited to find out where my characters would take me during my next session, so it felt like I was reading the book as I was writing it. It just took a little longer. What about the times you didn’t enjoy writing? Writing is like exercising. Getting started is the hard part, but once you get going, there is no stopping. However, there were times that I just didn’t want to do any writing at all, but I knew that if I didn’t get my quota done, I would have to work extra long the next day to catch up to meet the contest deadline. I did that once or twice, before I swore to never skip a day again. We did leave town to visit my parents during the Thanksgiving holidays, which I had to plan for in advance. I wrote an extra 800 or so words for a few days and then wrote my planned 400 words each night while out of town. That way I could enjoy my family, but also spent some time with my characters as well. Did you finish your story at the end of NaNoWriMo? Yes, I did get all the way through. By taking some time off and hanging my certificate on my office wall for everyone to see – I think, I deserve bragging rights for an accomplishment like this, wouldn’t you agree? Will you do the challenge again? Most likely. It’s a good way to finally get that book you’ve been dreaming about written. The rest of the year is spent to revise, tying up lose ends, and polish it up to make it presentable. This entry was posted in Novel Writing, The Heidelberg Ghost and tagged National Novel Writing Month, Word count, Writers Resources, Writing. Bookmark the permalink. 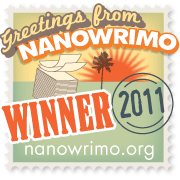 1 Response to I’m a NaNoWriMo Winner!